After seeing his workplace flooded with three inches of antifreeze, Peter Flannery of Clifton Park, N.Y. decided something needed to change. Several years later, after completing a Bachelor of Science in Sustainable Management degree, Flannery says his life is, literally, rooted in sustainability. The future of green building? Peter Flannery and his employer, Ecovative, helped build these eco-friendly towers. It was a major glycol system accident at the plant in 2003 that brought his thoughts on sustainability to a head. The disaster left the plant covered in antifreeze and the company reeling. “After the costly cleanup, their response was to shut off the glycol system and replace it with running city water,” says Flannery. This presented two problems: running water is expensive, and the wastewater was dumped into Lake Michigan. Though it didn’t contain pollutants, the wastewater raised the temperature of the lake, endangering natural inhabitants. Concerned about the effects on the surrounding ecosystem, Flannery investigated sustainable practices over the next few years. The plant shut down in 2010, but a new opportunity appeared with the passage of the Trade Adjustment Assistance Extension Act of 2011—the opportunity to go back to school. “That’s a big decision when you’re 45 years old,” Flannery says. But he took the plunge, enrolling in the UW Sustainable Management program. 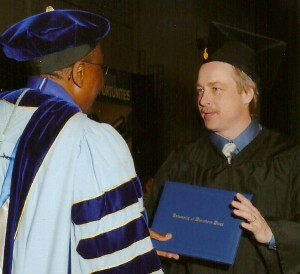 With his degree complete, Flannery’s job search led him to Ecovative Design in New York. He now works as a parts manager for the company, which takes agricultural byproducts and introduces mycelium into the waste. Mycelium, the root structure of mushrooms, grows through the waste and acts like a glue. The material is then made into home-compostable products that can replace synthetic or toxic materials such as Styrofoam and engineered wood. The company’s first commercial product, called Mushroom® Packaging, is a high-performing, cost-competitive alternative to plastic foam packaging parts, in use by numerous Fortune 500 companies. Flannery’s experience and education are opening exciting new opportunities to work on sustainable projects. His latest is far bigger than he could have imagined: an art exhibit that represents what could be the future of green architecture. 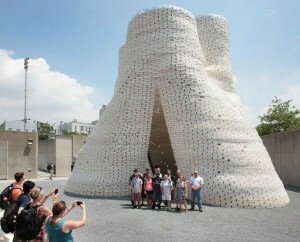 Developed in partnership between Ecovative and architect David Benjamin and his firm, The Living, the eco-friendly exhibit features silo-like towers made of 10,000 mushroom bricks that Ecovative grew over the course of three months for the project. The mammoth, mind-boggling oddity took top honors in the Museum of Modern Art’s 2014 Young Architects Program, but its true purpose is to beckon a new era of sustainable architecture. Everything is local. Everything is natural. The structure is asymmetrical and flexible, yet able to withstand even hurricane winds. When the exhibit closes on September 6, everything will be composted. Flannery is a realistic man. As he says, “Nobody can build something like this and live in it right now, but it is the first step toward the future.” That’s what he is looking forward to—the future. For Flannery, that means new and challenging sustainability projects, ones he knows will propel us toward a more viable future, even if it is one mushroom brick at a time. To find out how you can get your start in sustainability with an online UW Sustainable Management degree or certificate, visit the program website or call 1-877-895-3276.